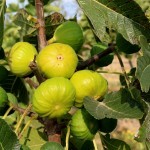 A reliable fig for cool, short season areas. The green skin brings a welcome tartness to the sweet taste of the honey-colored flesh. Excellent for canning, drying, and fresh eating. Grow in full sun to part shade in a rich, well-drained soil.